Dr. Munk from Department of Emergency Medicine, University of New Mexico reported a case of metallogeusia (metallic taste) after a male patient ingested some pine nuts. The researcher documented the symptoms then conducted physical, dermatological, and dental examination of the patient followed by neurological, motor, sensory and reflex testing. All exams and tests came back normal and perceived cacogeusia improved without any treatment within 5 days (just like in my case). Dr. Munk then put down his stethoscope, took off the lab coat, sat down in front of a computer and continued his research using “Google Trends”. He examined Google search volume for the terms “Pine Mouth”, “Pine Bitter” and “Pine Taste” over a period of time and noted a significant spike in search popularity in the 2nd quarter of 2009; however, Munk didn’t proceed any further to investigate the exact cause of the surge. Unfortunately, Dr. Munk’s findings don’t provide the answer to a mechanism by which newly found triglycerides cause metallogeusia; however, he clearly shows that the correlation between pine nuts ingestion and metallic taste is real. It’s been more than a year since I had a case of “pine mouth“, even though I have had plenty of pine nuts from various parts of the world: Russia, Italy and China. Could it be just an anomaly caused by some abnormal weather condition in China back in 2009 that caused pine trees to produce these unusual triglycerides? Munk, M. D. “Pine mouth” syndrome: cacogeusia following ingestion of pine nuts (genus: pinus). An emerging problem? J Med Toxicol 6, 158-159 (2010). I think I`m suffering from severe `pine mouth`as it has now persisted for more than 4 weeks. Have you any idea how long is the maximum it can last?. I have carried out all medical tests, except for heavy metals. Pine mouth cases leave a bad taste. (c) 2010, The Irish Times. PESTO MAKERS: beware of where your pine nuts are coming from. The Food Safety Authority has logged 24 cases in less than two years of a strange new phenomenon known as “pine mouth”, which is suspected to be caused by inedible Asian pine nuts having been added to the food chain. The phenomenon was first noticed nine years ago, and it has baffled scientists and toxicologists in food- safety agencies across Europe. There is, as yet, no clear known cause for the bitter or metallic taste reported by sufferers, which starts one to three days after eating pine nuts and can continue for up to two weeks. In this writer’s case it resolved itself within four days and started exactly 48 hours after eating a sprinkling of pine nuts in a salad. Symptoms have been reported after eating not just fresh pine nuts but pine nuts processed into pesto, cooked or roasted. The FSA says it’s not aware of any adverse health effects associated with pine mouth. The European Food Safety Authority is currently looking at the issue, and is due to report on its findings before the end of the year. 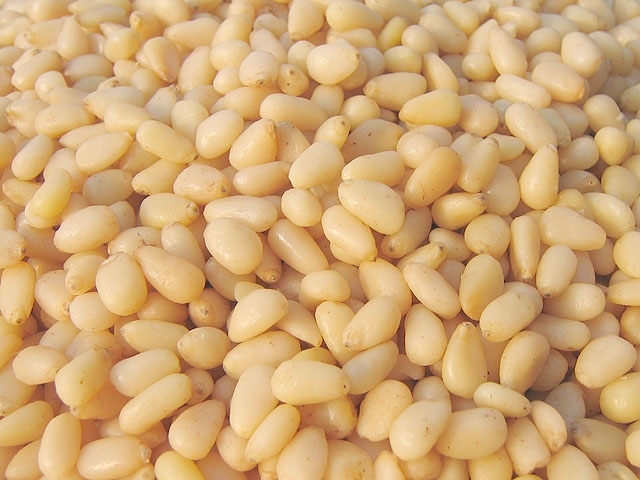 Earlier this year a Swiss study found that the botanical origin of pine nuts could be identified by checking the fatty-acid profile. The study found five species of pine nuts on sale, including the Chinese white pine and Chinese red pine, which “are only cultivated in China and are not listed as common sources of edible pine nuts by the Food and Agriculture Organisation”. In Germany, the Federal Institute for Risk Assessment found that the phenomenon occurred after eating the Korean pine nut, which originates in China or Pakistan, even though this is a pine nut commonly eaten. Gregory Möller, professor of environmental chemistry and toxicology at the School of Food Science, a joint programme between Washington State University and the University of Idaho, has an interesting article in the May issue of Food Technologymagazine (ift.org) in which he sifts through the various suggested causes of pine mouth. In an unpublished update, Prof Möller adds: “We are currently exploring the high levels of a particular oxidised terpene compound, linalool-oxide, that we find in some of our pine nut samples. Linalool is a common natural fragrance found in pines and several other plants, and it is used in many consumer products. Choose wisely, is his advice.